I, ever the cynical journalist I suppose, am here to tell you that I dispute those phrases. Maybe not completely, but I dispute them. First, not to sound like Neil Degrasse Tyson, but time is a constant. It doesn’t really change. I mean, sure, it passes differently as you approach the speed of light. Think of a clock acted upon by gravity. The farther you are from a gravitational body you lose fractions of a second so, for example, if you’re on the top of Mount Everest, your clock is moving, I suppose, at a wholly different rate than those at the foot of Everest. But that rate is a fraction of a second. I know, mired in miscellany, that’s me. It’s a metaphor. It’s supposed to show that time seems to move in the blink of an eye. Again, though, that’s not a constant . . . and time, as I postulated up there, is a constant. It would be easy to say, seeing my oldest daughter’s photo on Halloween, that I blinked and she was suddenly the 20-year-old adult up there. I’d be lying, though. 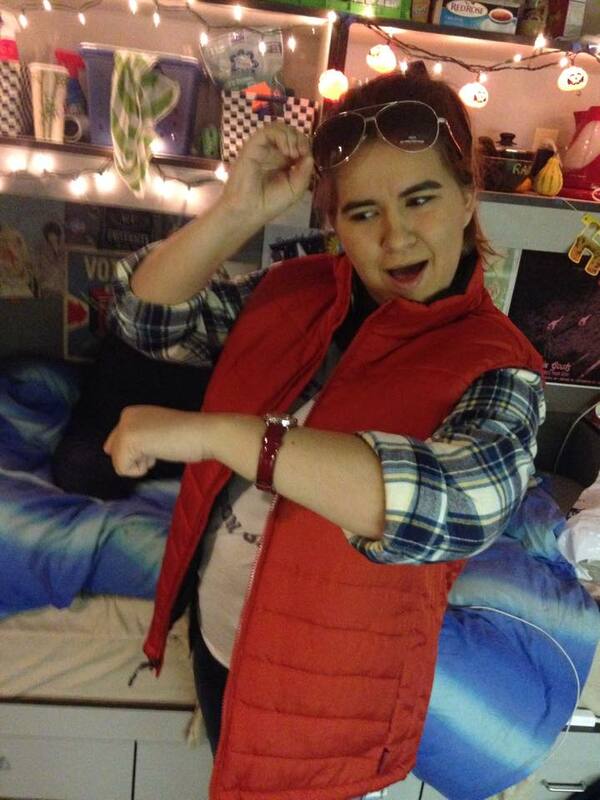 I saw that picture of her costume and I both admired her ingenuity and was proud of the fact she chose Back to the Future as her theme. My girl. She used to be this tiny little thing and now she’s a mature, happy, busy adult. No, time doesn’t fly. Our attention spans do. We get so wrapped up in our daily lives that we don’t take a step back and see what’s happening. I came to this conclusion this week alone. The twin boys up there, walking in front of me during Halloween, are completely different heights. Now, sure, this is the time of life for them where they can almost literally go to bed and wake up having grown a couple inches. Growth spurts are normal. Still . . . the difference in height and size was particularly pronounced today. I came into this day, by the way, exhausted. I’d done a massive 15-hour shift at work on election night and then come home to do my normal evening routine . . . at 1:30am. I was in bed at 2:30 and still up at 6. I worked late again today just because that’s the job I have. It’s not a problem, I’m not complaining, either. I have other advantages in my job that make up for the occasions where I work late. Still…exhaustion was setting in and I was falling behind, both mentally and physically. That’s when I noticed the differences in the kids. I could say “time flies” but it hasn’t. From 2011, when my wife passed away, to 2012 was one of the slowest, most painful, most mired in emotional molasses years I’ve ever seen. So when the last two years have seen the boys grow, their sisters mature and life swirl around us it’s not flying, it just is. A constant. As much as we’ve seen symphonies and taken trips and seen adventure I’ve also had many days bogged in routine. That’s where we don’t notice the time passing. Time hadn’t flown, it simply passed and I ignored it. Which brings me to the “treasure” phrase of that sentence. “Treasure every moment!” If you’ll pardon the vitriol, I won’t. I don’t treasure the late nights/early mornings where my then 4-year-old kid was standing in my bedroom saying “I feel yucky” then throwing up all over the floor. I don’t treasure the thousands of lunches I must have made for school every day. I don’t treasure the panicked look my kids had when they walked out of their bedrooms hearing me arguing with their mother. I don’t treasure the week I barely saw the kids because I was hovering over their mother in the hospital. I certainly don’t treasure the horrible moments after telling them that same Mom wasn’t coming home again. I cook every night and my son joins me. I make new desserts and when they like them their entire expression changes. I took them to Disneyland on the anniversary of the week their mother passed away. We had fun, we didn’t act sad. We make music and make music videos every year to show where we are now. I don’t “enjoy every moment” because, let’s face it, a lot of those moments just aren’t very enjoyable. That, after all, is what life is all about.